Objectives: Minimally invasive surgery for gastric cancer remains controversial. The aim of this study is to compare short term and medium term outcomes and adequacy of tumour resection, in open versus laparoscopic gastric resections. 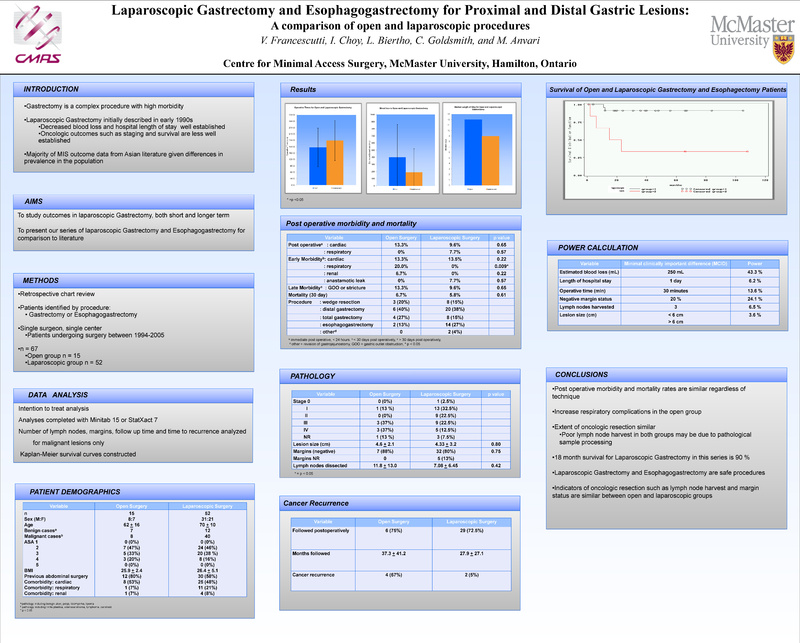 Methods: Clinical data on all patients undergoing open (n = 15) or laparoscopic (n = 52) gastric resection by a single surgeon at a Canadian center from 1993-2005 were collected retrospectively. Results: Mean age of patients was 61.7 years for the open group and 70.5 for the laparoscopic group (p = 0.06). The open group consisted of 13 gastrectomies and 2 esophagogastrectomies, while the laparoscopic group consisted of 38 gastrectomies and 14 esophagogastrectomies. Mean difference in operative time was 32.3 minutes (open 209.0 min, laparoscopic 176.7 min, p = 0.24). Median length of hospital stay was 12 days in the open group and 9 in the laparoscopic group. Ten laparoscopic cases were converted to open (19.2 %). Early post operative morbidity (< 30 days) was not different, occurring in 7/15 open cases and 20/52 laparoscopic cases. There was one death within 30 days in the open group, and three in the laparoscopic group (p = 0.61). Mean follow up for open and laparoscopic groups was 32 months and 26.4 months respectively, and during this period there were 4 (33%) open and 3 (7%) laparoscopic cancer recurrences (p = 0.04). Conclusions: Laparoscopic approach for treatment of gastric cancer does not have a deleterious effect on cancer related outcome.